Allergy & Anaphylaxis Emergency Plans are designed to provide clear, concise instructions on how to quickly assess and manage symptoms of a developing allergic reaction. Symptoms may be mild at the beginning, but if left untreated may progress to more severe symptoms. This is why prompt treatment is essential, and is the main reason for why your doctor urges you to be very familiar with your allergy action care plan. Once epinephrine is administered, an antihistamine should also be administered. If there are respiratory symptoms, albuterol can be administered as well. If the allergic reaction is limited to isolated skin symptoms, oral symptoms or throat itching, or gastrointestinal symptoms not including vomiting, you can use an oral antihistamine first and observe the person very closely, with a source of epinephrine ready to be used if symptoms progress. There is some debate about what to do for someone with a past history of a severe reaction who has eaten the food allergen or was suspected to have eaten the allergen but has not yet developed any symptoms of an allergic reaction. Some care plans strongly urge that epinephrine be immediately given or that an antihistamine should immediately be given. Some experts have advocated that this is the best strategy. Others have advocated treatment according to the symptoms that develop. It is difficult to say what the best strategy is. There is minimal downside to using epinephrine – it will “work” for mild symptoms and should not result in adverse reactions beyond some temporary local pain, bruising, and short-term jitteriness. It is unknown whether presumptive use of epinephrine contributes to reduced quality of life. Sit down with your doctor to discuss the pros and cons of what to do in these situations. It is important to be deliberate and not hesitate when you have to use epinephrine. The device is potentially life-saving and has far more benefit than risk. Should your child receive a dose of epinephrine, he or she requires 4-6 hours of medical observation in case the reaction escalates or a second (biphasic) reaction occurs. Additional medications may be needed (steroids, antihistamine, or additional doses of epinephrine). Eliminate all risks of additional allergen exposure. Call 9-1-1 and/or seek medical attention immediately. Monitoring or additional medications may be required. Repeated doses of epinephrine may be necessary every 10 minutes if the symptoms are not going away. After epinephrine has been administered, have the person lay down with his or her legs raised, if possible, to help restore blood flow to vital organs (heart, lungs, brain). Administer secondary medications to help the patient breathe, such as an asthma inhaler; antihistamines to relieve itching and hives; and other medications as directed in the Allergy and Anaphylaxis Emergency Care Plan or as instructed by emergency medical personnel. Delays in giving epinephrine can result in rapid decline and death within a short amount of time. 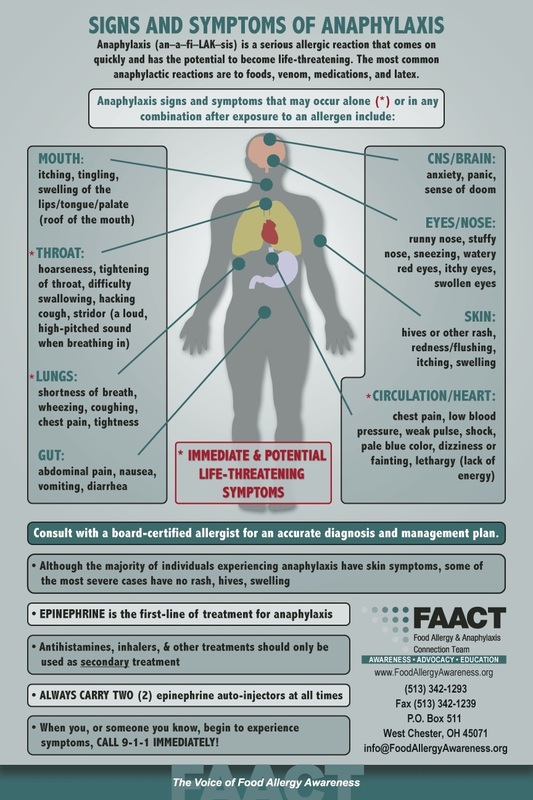 When treating anaphylaxis, epinephrine is the first-line of treatment! Antihistamines, inhalers, and other treatments all have a delayed onset of action and should only be used as secondary treatment. These medications cannot be depended on to reverse anaphylaxis because they will not restore low blood pressure or poor circulation. Antihistamines in this case become secondary agents, to be used only after epinephrine has been given. They are still important to give, but not instead of epinephrine. Allergists recommend that all individuals at risk for anaphylaxis carry TWO epinephrine auto-injectable devices with them at all times AND an Allergy & Anaphylaxis Emergency Plan (AAP) signed by a board-certified allergist. ** You should take your epinephrine auto‑injectors everywhere you go, but they should be kept at room temperature (25°C, 77°F) until the marked expiration date, when they should be replaced. Your epinephrine auto-injector should not be refrigerated or exposed to extreme heat or light. Keep these temperature requirements in mind if you’re thinking of putting your auto‑injectors in your car’s glove compartment, for example. Download FAACT's Poster for Epinephrine Auto-Injector Options - 2018. Visit FAACT Resources for more information. Visit FAACT's Education Resource Center for FREE and downloadable resources. FAACT's FIST to THIGH "SIGN"
What would you do if you needed epinephrine...but you couldn't be heard? Do you have a "SIGN"? There might be a time when you are too far away for someone to hear you clearly or anaphylaxis is making it difficult to speak. Share this "SIGN" with others so they can quickly respond in an emergency. And, please share this video to help FAACT spread the word about this potentially life-saving "SIGN"!